Arsenal cruised into the Fourth Round of the FA Cup by defeating Sunderland with a similar scoreline to when the two teams met at the Emirates in the Premier League at the start of December 2015. An early goal from Sunderland’s returning midfielder Jeremain Lens inside the first 20 minutes stunned the home crowd but Joel Campbell’s majestic one-touch finish restored parity. Aaron Ramsey scored from the bench to give the Gunners the lead in the 72nd minute and striker Olivier Giroud rounded off the scoring with a tap-in four minutes later to give the home side a comfortable win at the end. The Arsenal stopper could do nothing about Jeremain Lens’s goal. He was his usual self, being solid between the sticks. He came out on top when the Sunderland wingers and fullbacks got crosses into the box. The youngster was pinned back in the first half but came out with two assists in the second half from two trademark overlapping runs. Another fine performance from the young Spaniard who dealt well with the threat of Patrick van Aanholt. The Arsenal fans feared the worst when the Brazilian defender picked up a knock in the first half but he carried on and was solid at the back. He was rarely troubled by the attackers of the Black Cats. He seemed similar to Koscielny at the back – assured and attentive. The French defender should have cleared his lines when he was pressured by Lens which led to the first goal. However, he was partially at fault for it along with Gibbs. He made up for that lapse by producing a trademark performance afterwards. The fullback’s hospital pass to Koscielny led to the Sunderland goal. He could have cleared the ball away instead of a back pass. Apart from that, Gibbs was fairly untroubled at the back. He also got into the attacking areas and provided width to the Arsenal attacks. He did a decent job of shielding the back four but he had his occasional wobbles. He got overrun at times as the opponents bombed forward on the counter. He stepped out from midfield to attack on multiple occasions but his decision making was not precise. He needed to perform well in order to get his place in the starting XI, but could not produce a level of performance required. He gave up his defensive commitments to go forward and managed to hit the post late in the game. He did show plenty of energy in midfield but needs to pull up his socks. The youngster showed why he was given a start. He drove forward at every opportunity in the first half and looked lively. He created plenty of chances and proved to be a menace. He is a big prospect for the Gunners and he’s still 19. He was probably the best player for Arsenal apart from Hector Bellerin. He finished coolly with his left foot to level the score at 1-1 and played a great ball in the build-up to Ramsey’s goal. The Costa Rican is looking confident and can be in the starting XI against Liverpool. 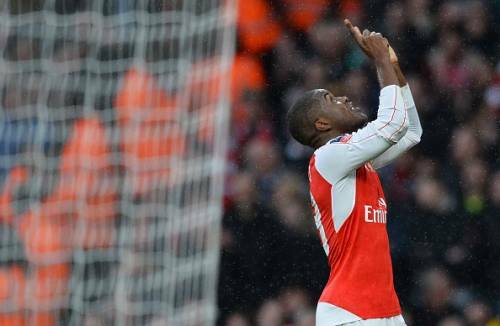 He popped up with a nice assist as his low cross found Campbell in the box to bring the scores level. But did not do much throughout the game. He was lively in patches but was possibly outshone by youngster Iwobi. The French striker went missing for the most part of the game. He had a quiet display but got on the scoresheet to make it 3-1 when Bellerin presented him with a tap-in. He did not get many crosses to feed off but still got the goal. The Welshman came on in place of Iwobi and instantly gave Arsenal a boost in midfield. He scored the crucial second goal to give his side the lead in a top substitute performance. The Spaniard returned from a muscle injury and brought with him a calming presence to the midfield. Arsenal fans will hope he can be available for the rest of the season. He got a big cheer from the home fans when he came on. But barely got to touch the ball. He seemed nervous on his debut for the club but will get more opportunities in the future. The young shot-stopper made his debut for the club. He was assured at the back, and could not do much to deny the three goals as Arsenal’s precision was there for all to see. He could do nothing when the Gunners play in that fashion. But he was the pick of the Sunderland players with three notable saves. His pace and crossing ability was one of the few bright spots for the visitors. The American, however, tripped Olivier Giroud late in the second half and should have been booked for that, but referee Martin Atkinson did not see Yedlin’s offence. He had a good first half but struggled in the latter stages of the game when Arsenal put pressure on the Sunderland defence. He had his run-ins with the pacey attackers of Arsenal, luckily for him, it did not cause much trouble. The former Manchester United man had a fairly decent first half. He coped up with the threat of Giroud and Walcott but struggled in the second half. He was taken off after the hour mark by his manager, possibly resting him for the midweek trip to Swansea. He was made to look insulted by Hector Bellerin’s second half display. The Sunderland man could not stop the right back from getting in the crosses. He did go forward on a couple of occasions but to no avail. The defensive midfielder could not provide a cover to the back four at all times. He did not have enough possession to affect the game, and produce chances for his teammates. He was also taken off by Sam Allardyce late in the second half. He was missing throughout the game for Sunderland. He did not get in the tackles, did not stop the passes in midfield and struggled to cope up with the quality of his opponents. He spent most of the game off the ball and went unnoticed. He was one of the brightest positives for Sunderland from the game. He scored his 3rd goal of the season after returning to the starting XI. He produced a fine performance and must be in line to start in midweek. He caused the problems for Arsenal through his runs through the middle. He forced another save from Cech late into the game, could have had two goals to his name. He has been one of the positives this season for Sunderland. Sam Allardyce rates him very highly and he showed exactly why. He made some marauding runs into the Arsenal territory, but could not come up with an end product. Apart from one chance throughout the game, the attacker could not provide anything to his side when going forward. The forward was assigned a left-sided role in midfield by his manager and did not fare well. Fletcher led the attack for Sunderland throughout the game but apart from two headed efforts in the second half, one of which hit the woodwork, he could not provide any ray of hope for his side and their fans. He did not see much of the ball after coming on in place of Lee Cattermole, who seemed to have been injured. The substitute came on in place of O’Shea and barely had a chance to impress. He went missing in defence as Arsenal scored two more goals. The forward came on for Steven Fletcher when Allardyce felt the game was finished and out of their reach to give Fletcher some rest. Mavrias had a very ineffective cameo.